Cape Caution attracts very deferential treatment in the pilots and sailing guides, a place to be avoided in anything but the very calmest of weather they say. We didn't get a chance to test the veracity of these claims as we had mirror calm conditions for our rounding of the Cape. Nonetheless Cape Caution is a natural boundary between the relatively gentle cruising grounds that lie to the east of Vancouver Island, and the altogether more wild and remote stretches of the Inside Passage that lie to the north of the Cape. Once north of Cape Caution places to come alongside and replenish food and fuel are few and far between. Most nights have been spent at anchor in places with often frightening names like Fury Cove, Breaker Passage, Windy Bay and Rescue Bay. Fortunately, the Pacific high has continued to do its job and our nights at anchor all have been blissfully calm with nothing worse than a few midges around sunset to trouble us, and even those have been very benign compared to their counterparts elsewhere in the world. In between anchorages we have wound our way through the many channels that go to make up the Inside Passage. Between Vancouver Island and Prince Rupert there are actually 2 inside passages. The inner and most commonly travelled of the 2 leads well inland through high mountains and relatively narrow channels. The outer one winds its way through the lower lying offshore islands. We had originally intended to take the outer of the 2 passages, but with a northerly gale forecast to blow for almost the entire week we decided the inner one would be a more prudent option. It was a decision we didn't regret. The inner leads seem to have their own microclimates when it comes to weather, with mountains, terrain and time of day dictating wind directions and strength rather than barometric pressure and weather systems. Whilst the forecasts have continued to predict 30-35 knot northerly winds for our sea area, some 35 miles inshore we have been enjoying clear blue skies, mirror calm conditions overnight and in the early mornings, and just the gentlest of southerly inflow breezes in the afternoons. It is difficult to believe that we are in the same sea area as the forecasts, but with such stunning scenery surrounding we are not in a rush to go outside and find out whether it really is blowing that hard outside !! An added bonus of taking the inside route was a sighting of the extremely rare and elusive White "Spirit" Bear. A genetic variant of the far more common black bear, the Spirit or Kermode Bear is only to be found in the Great Bear Rain Forest and they number less than 400. 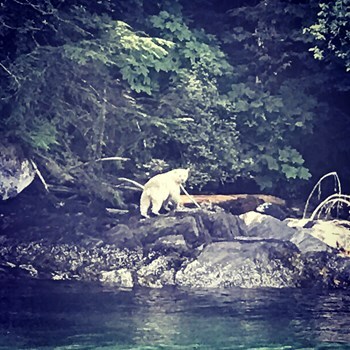 We spotted one of these magnificent white bears foraging on the rocks at the foot of a near vertical slope. We could not fail to be amazed at the way this supposedly lumbering beast nimbly tripped from rock to rock never putting a foot wrong. Bouts of scavenging for shellfish on the rocks were interspersed with forays up into the trees, shaking the foliage for any food that could be dislodged. We were mesmerised for a good hour at the end of which it was easy to see why the spirit bear figures large in local Indian mythology. We expect to reach Prince Rupert and the Canadian border with the next few days and then a decision will have to be made , to continue northwards into Alaska and find somewhere to overwinter there , or do we make our way back the relatively benign climate of southern Vancouver Island for the winter and then make a dash north to Alaska early next season? All the boats we have passed in recent days have been heading south - but do we really want to follow the crowd?! !